In a move that isn't surprising at all when you consider how popular high fashion sneakers have become as of late, Brand Jordan looks to release these "Jordan Shine" luxury spin off's of the classic Air Jordan 1. The shoe uses that same classic silhouette and then takes things up a notch with high quality leather used throughout in a basket weave pattern on the upper of the shoe. Available in both a blacked out and all red color way these will definitely be on a lot of peoples radar that are into the more luxury side of things when it comes to sneakers. We do however wish Brand Jordan would use these same materials on some regular OG retro releases and really shake the sneaker game up a bit. 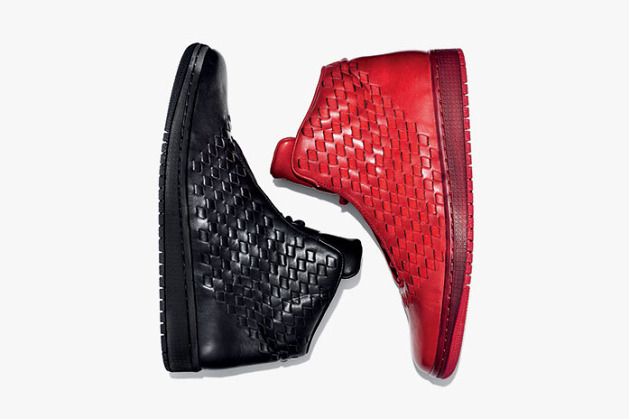 Stay tuned for more release information regarding the Jordan Shine as it becomes available.